Bruce Wayne’s engaged now, all set to marry Selina Kyle, the woman he’s chased across rooftops for a good chunk of his adult life. But as Batman and Catwoman get ready to tie the knot, it’s worth looking back at one particularly knotty relationship in the Dark Knight’s history. If you ask most people to name the great loves of Bruce Wayne’s life, you’ll hear names like Selina Kyle or Talia Al’Ghul, with more knowledgable folks shouting out Julie Madison or Silver St. Cloud. However, as the winds of change blow through Batman’s publishing history, one woman faded unceremoniously into the background: Sasha Bordeaux. Created by Greg Rucka and Shawn Martinbrough in 2000 and introduced in Detective Comics #751, Sasha Bordeaux grabbed me from the get-go. The first hook was the way she was introduced, hired to be Bruce Wayne’s bodyguard by Wayne Enterprises executive Lucius Fox. Her initial appearances zoomed right into the tensions of Bruce Wayne’s double life in ways that made for humorous and dramatic sequences. Storylines with Sasha made for a great way to look at the idea of a secret identity in a modern context. The trope asks heroic characters to lie to those who are close to them, which is often portrayed as relatively easy for those at the outskirts of the hero’s life, like, say, Lucius Fox. But being a bodyguard requires an intimate level of access, one that led Sasha to investigate just why Gotham’s richest man was prone to disappearances and large, unaccounted-for amounts of time. 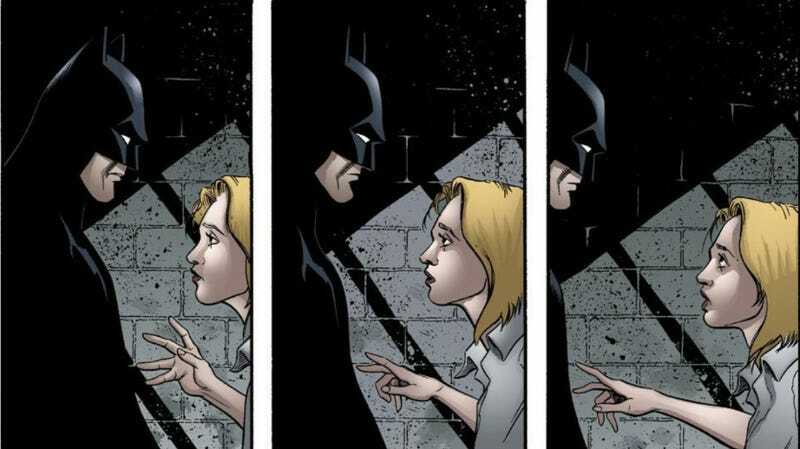 After she found out that he was Batman, he took her on as a partner, so that she could keep on doing her job. She watched him date and flirt with other women as a cover, struggling to understand the man who’d already has his ultimate secret found out. Chaos swirled around them as they kept Gotham safe from thieves, killers, and madmen. and one especially dramatic turn left both her and Bruce in jail and accused of murder. Sasha’s life went through the ringer but she always protected the Dark Knight’s secret, even when offered a plea deal that would let her go free if she said Bruce Wayne was a murderer. In the Bat-mythos, it’s an agreed-upon fact that loving the Dark Knight never leaves the other party in a good place. Sasha suffered one of the cruelest examples of that truism, languishing in jail for months after Bruce himself was freed. Then she suddenly died. But Sasha’s story didn’t end there. The super-spy organization Checkmate was able to resurrect her after the prison beating that ended her life. A woman trained by the Batman and believed to be dead would be a perfect asset for them and, seemingly abandoned by her cold-hearted one-time client, Sasha fell in with Checkmate. However Batman never bought the subterfuge of her supposed death and investigated with all of his frightening focus and resources. Eventually, Checkmate buckled under all the Bat-pressure and Sasha’s commanding officer ordered her to do what she needed to stop Batman from meddling in their missions. Her strategy was simple and devastating: go talk to Bruce Wayne. The conversation that follows lays out the terrible cost of being a Bat-ally and Bruce Wayne’s broken emotional pathways in a way that few scenes ever have. Distance from Bruce let Sasha realize that he actually wanted her to find out he was Batman, because he knew something romantic was growing between them. But, rather than simply tell her, Bruce made the process a mystery for her to solve. (This was happening in the Detective Comics series, after all. And, like any good mystery, the clues rudely smack you in the face once you work your way backwards through the story.) Everything that followed—the grueling training, the mask and costume, the crimefighting—was all so she could enter the relationship on his terms. Sasha states that she’s kept the big Bat-secret this whole time, months after Batman’s alter-ego left the prison she was stuck in. When she says that she loves him, the man who seemingly left her for dead says he loves her, too. More surprisingly, Bruce Wayne asks, pleads almost, for Sasha to stay. Statements of interpersonal emotional need are extremely uncommon in Batman stories, and when they do happen, they’ve rarely been this good. It ends the only way it can, with Sasha walking away from Bruce and all his Dark Knight dysfunction. She’d go on to be a main character in the Checkmate series that Rucka would later write, eventually getting into a much healthier and happier relationship with Michael Holt/Mr. Terrific. An entirely new character with the same name popped up after DC’s New 52 reboot but the current incarnation of Sasha has never enjoyed the same weight as when Rucka was writing her. Sasha Bordeaux is an increasingly rare example of a tertiary character shepherded through multiple storylines over multiple years by one writer. Rucka pulled off something special with her, using her as a device to find a fresh angle on Batman’s terrible grasp on relationships, while also growing her into someone who’d play an important part in the infrastructure of the DC Universe. Sasha Bordeaux became cybernetically enhanced and assumed command of a covert super-spy agency but her most fearsome superpower was this: She made Batman look at himself. Then—after he reckoned with what he cost her and apologized—she walked away to live a better life. That’s something that very few people in Batman’s circle ever managed to do.